Lauren is just like you. Originally from South Korea, she travelled miles away and took a leap of faith in order to study in the UK. It has been 6 years since she first moved here, and she will be graduating from her International Master's at Kingston University in September 2017. But she clearly came to the UK to achiever bigger things: to secure a top Tier 2 job and continue to thrive professionally. "Being in London and getting a job here, I will not exaggerate, this is my dream. If I am qualified here, I can go anywhere in the world and get any job," she says. For Lauren, working in London opens up a portal to endless professional possibilities. With the level of education she has acquired and the wider perspective she has gained through her experiences, Lauren will undoubtedly be an asset to any company. But with the current immigration climate in the UK, only 2% of international students succeed in getting sponsored and employed. The challenge for Lauren was getting through all stages of the UK job application process in order to make her dream happen. Being the go-getter that she is, Lauren took it upon herself to apply to several companies. She failed, and was disappointed, but she did not give up. At this point, she realised that she needed expert guidance. So, she decided to join CIUK. She said that the Assessment Centre sessions helped her a lot because of the immersive experience it gave her. The group and written exercises are very similar to the actual exercises conducted by top Tier 2 companies during the Assessment Centre stage. Having her personal coach also helped her work on her weaknesses and identify her strengths. The quick feedback she got from her mentor allowed her to quickly improve as well, which is why she was able to receive an interview invitation from a top Professional Services Firm after two weeks. Within a month, Lauren got invited to the Assessment Centre stage of the top Professional Services firm that invited her for an interview. She prepared by going to as many Mock Assessment Centre sessions with CIUK as possible. At the same time, she created more opportunities for herself by applying to 5 more top firms. Her hard work paid off, and she got invitations to do telephone and video interviews with other top companies. Lauren went on to receive job offers from 2 Top Professional Services Firms. The first person she informed about this is Mike, her personal mentor at CIUK, stating that her success would not be possible without his guidance. Getting two job offers meant a lot to Lauren because that means that she can continue to live in the UK, nurture the friendships she has formed here and give back to her family, who has financially supported her in her whole journey. Most importantly, she can finally begin take on a greater journey: starting her career and developing professionally. 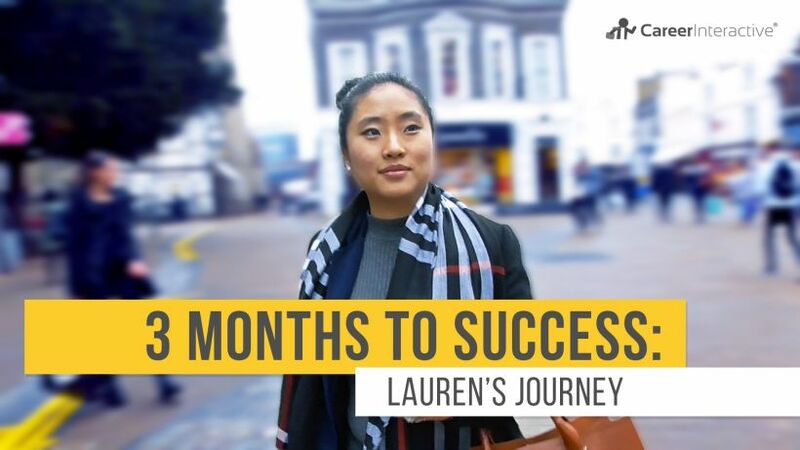 The road to success is not easy, but like Lauren, you can get there. Having the initiative to work hard, not letting failure dull your sparkle and getting help when you need it will take you there. You too, deserve to live and work in the UK. Start your journey now.